How many species of dog can you name? Flip Flap Dogs tells you about elevent different breeds. The format which has worked so well with other books from the Nosy Crow stable, does it again with Flip Flap Dogs, dividing its pages in two, so you can mix and match the pictures of the dogs. There are 121 combinations to make. That's 121 crazy looking canines! Each picture of the eleven breeds comes with a description that includes comments about its features, temperament and the type of activity it is most suited to. Sheepdogs work hard herding sheep, but also enjoy playing with their family. Beagles are amazing detectives, following smells along long trails, and don't like to share food. And whippets are fast, athletic and love chasing rabbits, which means you need to have a tight grip on them when out walking. There are also onomatopoeic sounds for each dog - everything from the yip-yapping dachshund to the growling dalmatian and ruff-ruffing terrier. 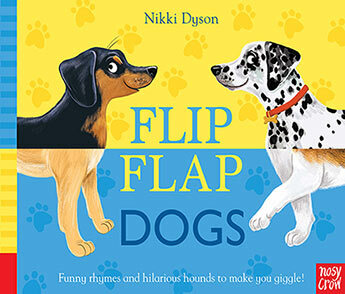 Bright and colourful with rhyming text, Flip Flap Dogs is written and illustrated by Nikki Dyson, and is the perfect book for dog owners and lovers.